The Aegis Patrol Pro and RCD Tester kit is the best Portable Appliance and Residual Current Device Tester on the market. 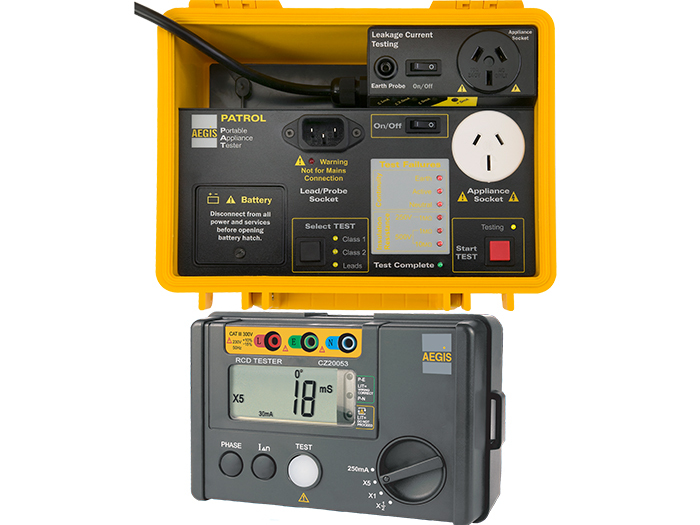 Protect yourself and your employees by ensuring that your portable electrical appliances and equipment are tested for electrical safety to AS/NZS 3760:2010 with the Patrol Pro PAT and RCD Tester kit. The CZ5001 Aegis Patrol Pro is a reliable portable appliance tester (PAT) and, along with the CZ20053 Aegis RCD Tester also included in this kit, is an essential piece of equipment for every workplace. You can make sure that your business is complying to OH&S standards by testing all of your electrical appliances with the Patrol Pro. It will perform the essential electrical safety tests required for portable appliances and equipment, and can be used to test domestic appliances, industrial appliances, power tools, electrical portable outlet devices and extension leads. The Patrol Pro can also detect earth leakages. It is designed to meet Australian and New Zealand safety requirements. All components of the Patrol Pro are contained in a waterproof, drop proof case. All test leads are also supplied with the kit so you can start testing as soon as you take it out of the box. Everything is tested to the Australian and New Zealand Standard (3760) relating to appliance testing. RCDs (Residual Current Devices) are designed and specified to protect people and equipment from the danger of electrical faults. Due to their inherent 'safety' nature, RCDs need to be tested on a regular basis to ensure their correct operation, which is where the CZ20053 comes in. With this fully featured digital device you can test all of your Residual Current Devices and protect yourself and your staff by ensuring that the RCDs are functioning correctly. The Patrol Pro and RCD Tester kit is the most convenient PAT tool on the market. Both testers are lightweight and fully portable, meaning your testing can be carried out anywhere with ease. The The CZ5001 Patrol Pro can operate from batteries or from a 240V AC supply, adding to its convenience. Building on the simplicity of the CZ5000 Patrol, the PatrolPro is the simplest 'run test' capable PAT on the market. To operate the leakage test you simply plug in the appliance and switch the power on. Using the probe you can detect any earth leakage; if detected, the leakage will be displayed during the test. Being separate units, two tests can be carried out at once reducing your overall test time. Additionally, the RCD tester can be used for all RCD testing, meaning you do not need another RCD tester for other applications. Not only do you get the simplest 'run tester' on the market, but an RCD tester suitable for all RCD testing purposes as well. If you are looking to test appliances, power boards or extension leads, and need a sturdy and dependable portable appliance tester as well as the best RCD Tester available, then Aegis has the perfect kit for you. There are many PATs and RCD Testers on the market but you won’t find any of a higher quality than this Aegis kit.